It one of the most common issue you will face when you will move/copy your database from one server to another server. You will have all finely setup SQL Server Logins and their related database users but when you copy or move your database those Server Logins will not get transferred automatically. Result is what we call Orphan Users, these database users are there in database but there is no login associated with it. In other words they are just useless and will create various issues related to authorization if an application or users are using it. There are many cases when you may need to manually map SQL Server Logins with database users. For example it is possible that you have different logins created in SQL Server and you wanted to use these new logins with existing users Or you might even have same logins but since they are on different machines it is very likely that they will have different SIDs (Security Identifiers) Or simply some users has left an organization and you want to assign new user existing login (which I think is more easy by use of ROLES rather than directly assigning a user) Or wanted to have different user name then server login. For all of these condition there is a system stored proc called “sp_change_users_login“ which can be used to manually assign logins to database users. I have created a simple demo to display the concept and process of mapping existing users to new logins. Ok, in first part we walked though creating basic report for SSRS using Business Intelligence Development Studio (BIDS),which was kind of an easy process I guess . Next step is every easier, which is deploying that report to report server so others (those who have permission) can access it. 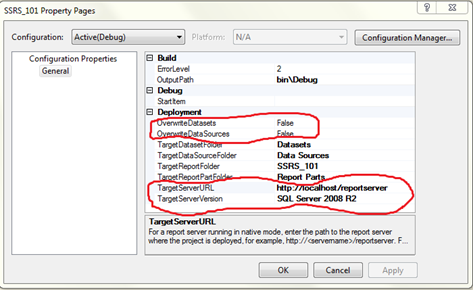 For deployment of report you will need to know URL for report server. In my case it is “http://localhost/reportserver”. 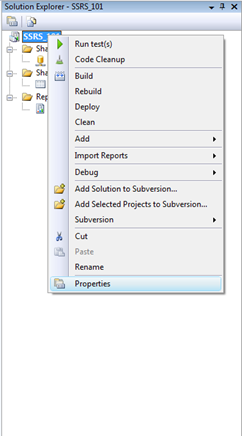 Settings can be setup for deployment in project property. Ok, so after some initial struggling of setting up whole environment for SSRS to work smoothly and after getting some sample data I am finally ready to begin my epic journey to SSRS (it is epic for me because most of the stuff that I am going to learn will be myself and I will not have any on-site help, but of course Google – his brethren .. i.e. Bing, Yahoo etc will be always helping me in my quest). Anyways, this first post will show how to create a basic report for SSRS using Business Intelligence Development Studio (a.k.a BIDS). Since BIDS is component of VS 2008 and it is not available for VS 2010, we are left with only one choice of IDE that is VS 2008 (if you have Pro or higher version or you are stuck with BIDS which gets installed with SQL Server 2008r2). But before doing anything I will create a sample table for us to use in report. Of course most of the “tutorials” out there are using standard Adventureworks database but for this report I am using my usual table that I practice with. Following is SQL Query to create that table, and of course you will need to have AdventureWorks 2008 r2 sample database installed (or you can modify this query to match your setup). 1) Shared Data Sources: which can be used to share same database connection across all report in that project, we will see later on how we can use this. Yes, though it sounds really strange for local instance of SQL Server Reporting Service (AKA SSRS) it is very real issue, specially if you are using Windows Vista (however I don’t understand why would someone use it )or 7. It is mainly because of new feature called User Access Control (UAC) which prevents system level access to users by default. Honestly, I don’t think UAC actually helps user from having extra security because there are always ways to get infected with malware or virus but instead of helping UAC can cause real troubles in many cases and to make matter worse, you sometimes have no idea that you are getting errors not because your crappy code but because of just UAC !! Recently my work sort of “shifted” from app development to SSRS, SSAS and SSIS (or just say BI). My new role will be more concentrated in areas of DB and BI (which I really enjoy to work with ) … So I was just playing around with those tools in my workstation. And at one time just to write a blog about I wanted to create a simple report in SSRS and tried to access it using Report Manager URL. And with surprise I stumbled upon permission error which was purely because of UAC. Now, I can resolve this issue by opening IE with run as administrator, and it should let me access report manager ! !